After our last article about The Chicago Skeptics, their leader requested that we run their most recent press release in the interest of giving them equal time. We accepted and below is more information about this year's Skepticamp. The Chicago Skeptics will be hosting their third Skepticamp on April 5, 2014. Chicago Skepticamp 2014 will be returning to the Irish American Heritage Center, located at 4626 N. Knox Ave., Chicago, IL 60630. Doors will open at 10:30 am. The event will run from 11 am to 6 pm. Skepticamps are informal, lively gatherings promoting science and critical thinking. Participants are encouraged to discuss and question both traditional skeptical topics and new subjects. Attendance is free, though all attendees are encouraged to help by either speaking, helping set up/clean up, or by making a donation. No one, however, will be turned away because they don’t have a specific task or for lack of funds. Last year’s event attracted approximately 175 attendees, compared to the 100 people who attended Skepticamp 2012. Last years topics ranged from psychology to Electronic Voice Phenomena (EVP) to evolution. 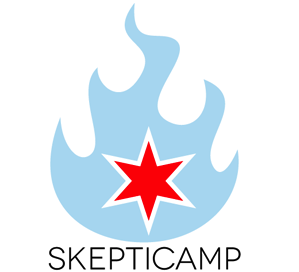 Over 100 people are expected to attend Chicago Skepticamp 2014. Everyone interested in attending Chicago Skepticamp 2014 can register at http://chicagoskeptics.net. General registration will be open until March 1, 2014. The deadline for speaker registration is February 1. Founded in 2006, Chicago Skeptics seeks to promote science and critical-thinking skills. Chicago Skeptics sponsors speakers and organizes discussion groups, as well as an array of social events such as concerts, book club meetings and science-centric field trips. Past events include speeches by Hemant Mehta, Brian Dunning, and Rebecca Watson. George Hrab has performed three concerts for Chicago Skeptics. More information about Chicago Skeptics can be found at http://chicagoskeptics.net/. Chicago Skeptics are also on Twitter @chicagoskeptics. Additional information about Skepticamps around the world can be found at http://skepticamp.org. Please note: All articles on this site are works of fiction, Chicago Skepticamp 2014 is a real event.